Gorgeous! I love Sakura's dress! She always gets such awesome clothes. Thanks for sharing! love it =3 beautiful scan. Gorgeous.love it very much^_^Thanks for sharing. Wow! Love it! Thanks for sharing! I love this pic, Sakura's dress is so beautiful. 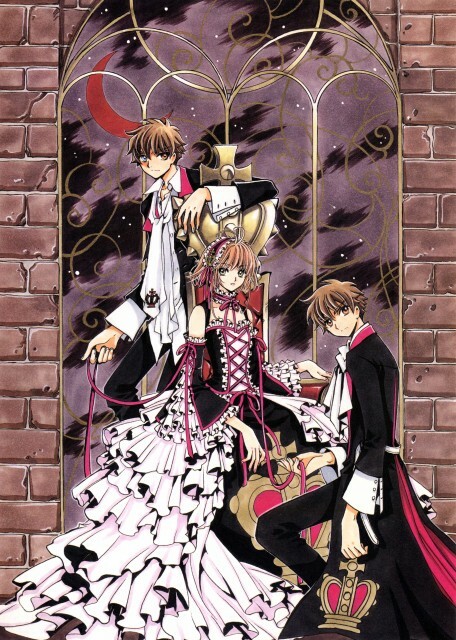 Two Syaorans wearing the same clothes however The clone Syaoran is undone while the Real Syaoranhas his shirt all done. I wonder how long until we see cosplay of it *laugh* beautiful scan! OMG! Two Syaoran is definetly better than one, no matter that the second is evil! Sakura looks so pretty here with the gothic clothing and the spoiled face. She looks so mature! Ah! Marissa-san. Your scans always top notch. Sakura and two syaorans which one will she choose? I love this image. The two Syaorans both have ahold of Sakura's ribbon. Very interesting little detail. CLAMP are amazing drawers.